Scurl No Drip Activator - New Formula and Fragrance! - Hairlicious Inc.
Scurl No Drip Activator - New Formula and Fragrance! 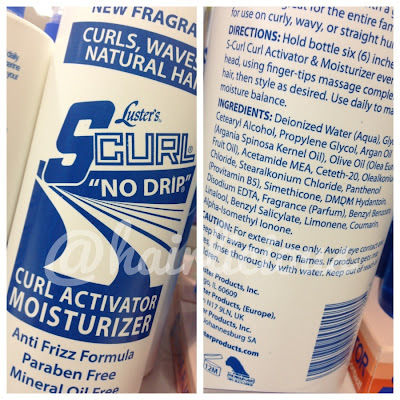 Luster's Scurl No Drip Curl Activator has come out with a brand new formula with a Fresh new Fragrance, minus the Parabens, Frizz and Mineral oil (the old formula never had Mineral oil). Scurl No Drip now contains Argan Oil and Olive oil. Nice! However, I don't like the fact that they added DMDM Hydantoin (formaldehyde preservative). I really don't think that was necessary. As soon as this product hit the market, I immediately got nervous. You don't understand, this product is my S-T-A-P-L-E!! It has multiple purposes in my hair care regimen (moisturizer, leave-in conditioner, new growth softener etc.) so if this new formula doesn't work for me and they convert all the sizes (8oz, 16oz and 32 fl oz) to the new formula.... I'll go nuts - literally! The good thing is, is that I only saw the new formula in the 32 fl. oz. so if this doesn't work out for me, I have the other sizes to fall back on. I just pray that they don't discontinue the old formula, in that scenario. Part of me is curious to see how the oils and glycerin will mix together. I'll be testing the new Scurl for the next couple of weeks and then I'll post my final thoughts. So far, I can say that the scent is a change for the better. It's smells very fresh and sweet (kind of like a Herbal Essences conditioner), however the consistency of the product looks the same - opaque and watery. We'll see how it goes. I hope it works for your hair as much as it does mine! I seen it at family dollar. I'm planning on buying it on Monday. I tried it today and really didn't like the smell. I can't describe it but it also gave me a headache. Like you, the original is my STAPLE! I'll be returning this bottle and getting the regular one asap. I can understand what you are saying. The scent can getting a little annoying after a while. You say the new formula in an 8oz? I hope they are not getting rid of the old. I have the 32 oz bottle from sallys beauty supply. It is the new formula. how dd u find out about the new ingredients? did u just always check whenever you are repurchasing? Yes and a couple Hairlistas informed me as well. I might just do the same!! I think it should be used within a year of opening. I have the new formula also, while I love the new smell--honestly it didn't penetrate my ng as well as the old formula. At 10 weeks post, I noticed it just sat on top of my hair and I had to really massage it in for it to absorb. I think that's due to the oil mixture. The oil could be just sitting on top of your hair. I literally just picked up the new S-Curl today. I still have some of the original formula left. I'm going to try the new one tomorrow after my cowash and go from there. I too am a fan of S-Curl No Drip so I'm hoping it still works. I did the same this week! Please let me know your thoughts. oh geez! lets pray everything works out!!!!! I love this stuff!! I might need to buy a bunch of the old formula bottles before they pop up where I'm at! Where in Toronto did you buy this? I JUST got the new formula like 30 minutes ago and I'm about to wash my hair. I was so surprised that they changed it. I wish they just changed the scent and left everything else alone, like...what if I don't want oils and just want moisture? If I wanted to add oils, I could use my own Argan or EVOO oil separately. But oh well, I'll update right after my wash. Thanks for all your fantastic reviews!!! UPDATE: I used the new S curl formula.....and I'm not feeling it at all. The fragrance is nice, but my hair feels 'off'. On the hunt tmrw to go to all the walmarts, cvs, and walgreens in the area to buy up the old formula....sigh...it wasn't broke, why'd you have to change? where is the point in putting mineral oil in a no drip spray ? I'm loving both the old and new formula though I just started using the new formula the last few days. It left my 4b/4c hair super moisturized and soft, I have twists in and i sprayed on the twists then sealed with jamaican black castor oil. This spray moisturizes my hair better than any of the prior spritzes I've used and for a longer period of time.